Hardcover, Spiral Binding, 160 pages, 21.0 x 26.0 cm, 8.3 x 10.2 in. When you are looking for individual clothes that fit perfectly and are well made, then make them yourself. With the right know-how, some professional tricks, and a bit of practice, this is simpler than you would think. 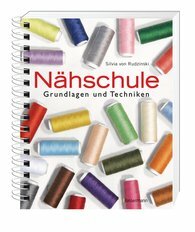 This standard work explains comprehensively and understandably 500 sewing steps – from the laying out of the patterns to sewing on the buttons. The illustrated step-by-step instructions are easy to follow. Sewing beginners are made familiar with the basic devices, the types of fabric and thread, and how to take measurements and make the right cuts and adjustments.